The Heisman Trophy winner checked into a Philadelphia hotel under a false name, the better to keep things hush-hush. The agent handed him a contract, along with two bonus checks totaling $10,500. Roughly a month later, the same Heisman Trophy winner placed a call with another agent, this one promising a more lucrative contract, along with a $20,000 bonus, ownership of five gas stations, half-interest in an as-yet-unformed eponymous oil company and, just because, a Cadillac for his father. The young man eagerly agreed. Oh, and two days after that, he played his final college game. Pop quiz: Is this part of a current college sports scandal, like the one at North Carolina, where a former assistant football coach allegedly introduced players to an agent? Is it the story behind former Southern Cal running back Reggie Bush recently returning his stiff-armed statuette? Is it one of the many unsavory revelations contained in former agent Josh Luchs' tell-all cover story in last week's Sports Illustrated? No, nope and not even close. The year this all went down? "To me, if you're going to put a bookend on this, go back to [Cannon]," said Los Angeles-based trial attorney Michael Trope, a former sports agent. "At the highest level of professional football, when it was to their competitive advantage to look in the other direction from the NCAA rules, they didn't hesitate. Between that and now is everything else that has transpired. And the only difference between Reggie Bush and what was going on before is the mountain of dollars. "It's the same system. When things get competitive, the early bird gets the worm." Athletes on the take. Agents on the make. Cash changing hands, breakin' all the rules. College sports -- that last bastion of wholesome, love-of-the-game amateurism -- has a problem. Always has, really. And whenever that problem rears its head -- as is the case with Luchs' exposé -- the reaction is to call for a crackdown. More enforcement. More punishment. More extolling the system as we know it, and more sliming of the bad, bad people who work around it. Moral purification. Only what if that's a foolish, self-defeating approach? What if agents paying players isn't actually a problem? What if the long, tangled, ongoing history of black market quid pro quo in college sports suggests that the real issue isn't bad people, but rather ... bad rules? (B) The way it works in real life. The year was 1972. Friendly with a number of athletes -- they were, after all, his peers -- Trope decided to become an agent. He quickly learned that college sports had an underground economy: coaches paid players under the table by selling players' game tickets to alumni. The same coaches then steered players to particular agents, ones who were friends and/or financial patrons. Trope once recruited a college linebacker. The linebacker's father was learning toward another agent. Trope asked the linebacker how the two met. A coincidence, said the linebacker. [The other agent] just happened to be sitting next to my Dad in the stands. They struck up a conversation. Trope knew better. The meeting was anything but coincidental: the other agent was tight with a coach at the school, and the coach had the linebacker's tickets. He knew exactly where the father would be sitting. On another occasion, Trope accompanied a wide receiver he was representing into a coach's office. Watch this guy, said the receiver. He tries to pimp me every time. Trope introduced himself as a player on the school's tennis team. The coach bought the story. He then opened his desk drawer and produced an agent's contract, imploring the wide receiver to sign, right then and there. "I started to realize that I was competing against every position coach employed by every team," Trope recalled. "If you decide to enter that cesspool and be a competitor, you have to make certain choices to be successful." Trope jumped into the pool. Called himself a fish. Made certain choices. (To wit: Heisman Trophy winner Mike Rozier claimed he signed with and took money from an agent associate of Trope's during the 1983 college season). Trope was successful, too, negotiating record contracts and at one point representing four of the top six picks in the NFL draft. When Trope left the business to take the bar exam and become a practicing attorney, he detailed his informal education in the 1987 book "Necessary Roughness" -- a book that illuminates the winner-take-all competition for athletic talent that permeates sports, a competition that mirrors both on-field action and, well, life. Trope's book tells the story of high school running back Kenneth Davis, who was offered a sports car by Oklahoma boosters, free use of a five-car fleet by Nebraska supporters and $38,000 in cash, clothes and other goodies -- including a shotgun and a rifle -- from Texas Christian backers. Go figure: Davis chose the Horned Frogs. The book quotes another high school running back, future NFL'er Eric Dickerson, recalling a University of Texas coach's recruiting pitch: "If you go to school in Oklahoma, I'll make sure you never get a job in the state of Texas in your life. If you come to the University of Texas, you name five of anything, and I promise you, you'll have them by tomorrow. Anything. Just five of anything." Five. Of anything. And still Dickerson went to SMU. (A program, shockingly, that later received the NCAA's death penalty). Of course, the inducements and incentives -- in other words: the stuff the rest of us take for granted in our free-market economy -- didn't stop on campus. In the book, Trope claims that former Rams owner Carroll Rosenbloom offered him $250,000 -- in a cash-stuffed suitcase, no less -- to convince the Oilers that Trope's client, star runner Earl Campbell, was somehow a problem ... and that the Rams would be happy to take Campbell off their hands. Two years after the publication of "Necessary Roughness," Trope was called as a witness in the trial of California State Sen. Joseph B. Montoya, who was convicted of racketeering, extortion and money laundering -- in part because he solicited large campaign contributions from both Trope and the NFL Players Association in exchange for his vote on legislation involving sports agents. At every level, there's recruiting. At every level, the early bird gets the worm. Agents. Players. Coaches. Owners. All playing the same game. Knowing the same rules. Flaunting them anyway. Does that make Bush, Luchs and everyone else corrupt? Or does that make them rational actors in a lucrative marketplace in which an insatiable demand for talent meets a highly limited supply, even though amateurism rules pretend otherwise? "Let me tell you what a big-time coach and program would have to do to be totally clean," Trope said. "You would have to know the name, address and phone number of every parent. The family of every parent. What kind of cars they drive. What their income is. Where they live. If they've changed residences. "Then find out all of the players' girlfriends. Their backup girlfriends. Their backups' backups. Their cell phone numbers. What kind of cars they drive. "Then you would have to have full internal investigations done of each assistant on your staff, because the easiest route agents use to get to players is by paying off assistants to make the introductions," he continued. "It would just be an overwhelming, monumental task that would cost substantial sums of money. You would need a FBI: a Football Department of Investigations." An entire department. To investigate ... what, exactly? The same thing that wouldn't raise an eyebrow if football players were musicians and Luchs was a record producer? 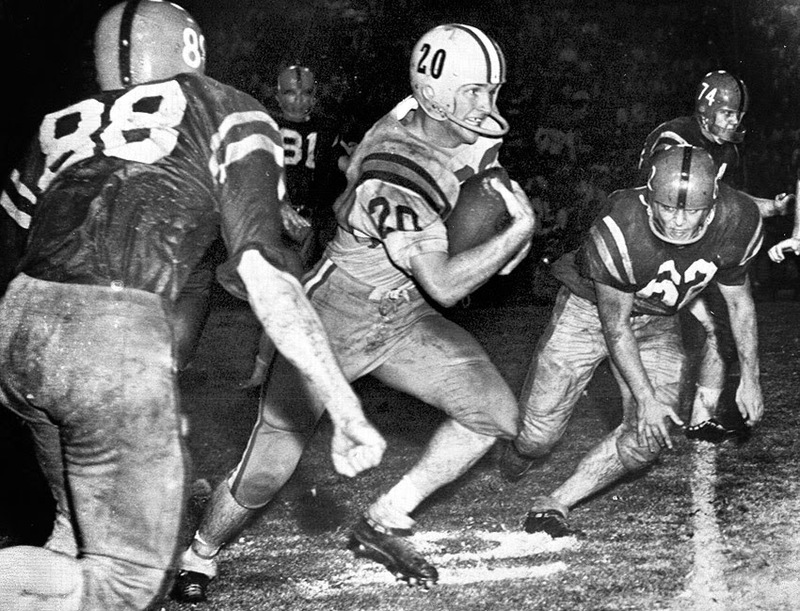 The same thing Billy Cannon did a half-century ago? Maybe the issue in college sports isn't agents, athletes or anyone else.